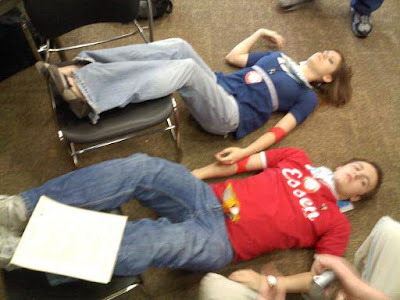 Yesterday, BYU 151 Ward had the opportunity to give blood to American Red Cross. I enjoy saving 3 lives and over all I have saved 9! WOOT! Yesterday was a great day. It was Aubry's first time successfully donating! After I finished my pint, I stood by Aubry and then she finished and we both walked to the chairs. I sat down and Nate, Jocelyn, and Aubry are talking to me and saying "Caulin, you're really pale. You're getting really pale really quickly! Should we get someone?" Then I remember mumbling "Yeah you should probably get someone." Then my sight goes out. I thought I just closed my eyes but I guess my eyes were open! I start to come to it and see this nurse guy putting ice on my neck and behind my head. He says "Do you know where you are?" I reply..."BYU?" haha. It was great. AND THEN!!!! like a minute afterward, AUBRY FAINTS TOO!!!! So we had a party on the ground. It was great. THEN afterward there was a Ward Activity in the Wilk. FREE BOWLING!!!! It was semi-foolish of me, but I bowled. Kangaroo Caulin and his no thumb 5 step approach bowled a 138. Not my best, but I'm very stoked with it. Bishop bowled too! Here's a picture of Aubry and I on the ground. If I didn't know better, I'd say that that's a pretty clever and rather original move to hook up with a girl. You two are now officially "Blood Brother and Sister"